Over the course of its history, the Tax Court has been alternately described as being an executive, judicial, and legislative organization. For example, because its decisions may be reviewed by federal District Courts, it can, and usually is, considered an arm of the judiciary.3 But when it was originally established as the Tax Board of Appeals in 1924, it was classified as an independent office of the executive branch, subordinate to the President.1 Yet in certain versions (up to 2008) of the annually released U.S. Directory of Executive and Legislative Appointed Offices had categorized the Tax Court as being part of the legislative branch.4 In practice, of course, the Tax Court does not create law, but reviews and passes judgement enabling the IRS to enforce tax policy. That is why today, it is generally accepted as being a judicial institution. The Tax Court has a rather unique relationship with the U.S. Supreme Court, and with the American three-branch structure of government in general. Its judges are appointed and may be removed by the president, but serve 15 year terms, rather than lifelong appointments like Supreme Court Justices.2 Technically, because its decisions are limited to tax policy and may be reviewed upon appeal by the Supreme Court, the Tax Court may be considered an inferior court within the judiciary. Because of the number of petitions received by the Tax Court, the standard wait for a court date is anywhere from six months to a year. It is during this waiting period that the overwhelming majority of cases are settled, preventing the need for a trial to take place. Ultimately, more than 90 percent of all Tax Court cases are settled outside of court, without a formal trial.5 Because the IRS must balance its mission to gather federal revenue against the cost in time and resources of going to court, its attorneys will usually make an effort to resolve disputes as efficiently as possible. 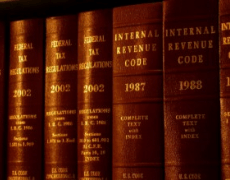 Taxpayers who petitioned their cases to the Tax Court are at liberty to accept these out of court settlements–as is typical–or else pursue the matter until they are due to appear in court. Even though the Tax Court does not usually host litigation over the cases brought to it, it still serves as a concentrated source of demand for tax attorneys. All of its judges are presidential appointees, typically experienced tax attorneys who have earned their LLM in Taxation and have experience working in the realm of tax law. These judges are also supported by a network of judicial clerks, all of whom help review petitions, conduct judicial research, and generally enable the court to function effectively. Given the need for manpower to accommodate the scale of the court and its nuanced mission, it should be no surprise that the U.S. Tax Court is one of the top employers for graduates of a LLM in Taxation program.